Elizabeth Nourse (1859–1938), Happy Days (1905), oil on canvas, 101.6 x 101.6 cm, Detroit Institute of the Arts, Detroit, MI. The Athenaeum. By 1895, Elizabeth Nourse (1859–1938) had lived and painted in northern France for eight years. Her travels had taken her as far afield as Italy and the Netherlands, and she was exhibiting her work successfully in France, and at occasional international events. Elizabeth Nourse (1859–1938), The Sewing Lesson (1895), oil on canvas, 119.4 x 78.7 cm, Private collection. The Athenaeum. 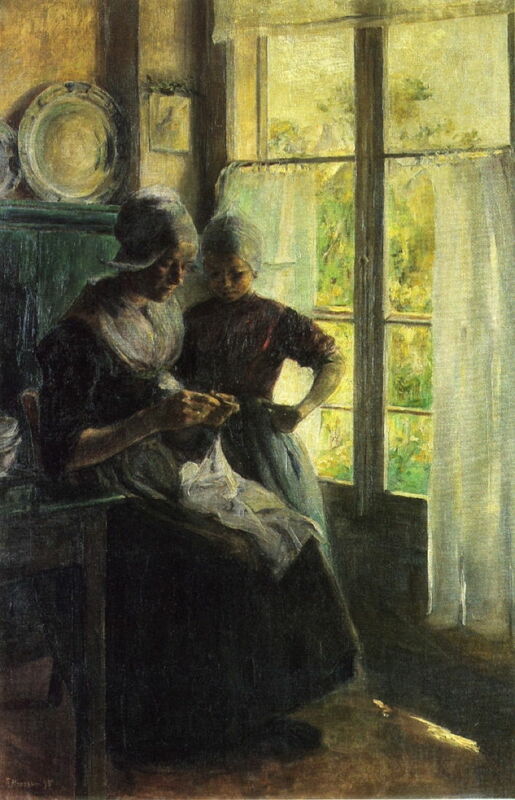 The Sewing Lesson from 1895 shows a Dutch mother teaching her daughter to sew, against the backlight from the doors filling much of the painting. 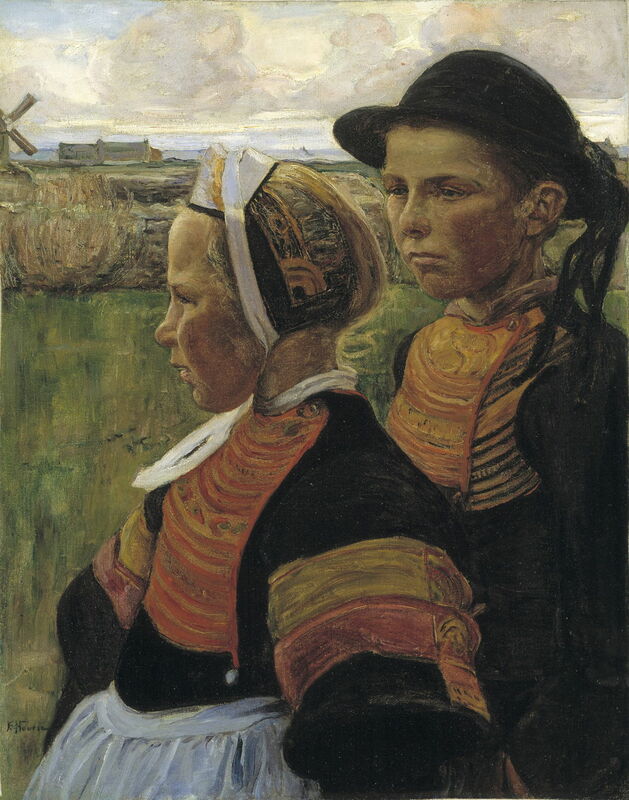 It is possible that this was also painted at Volendam, and suggests that she may have returned there following her initial visit in 1892. 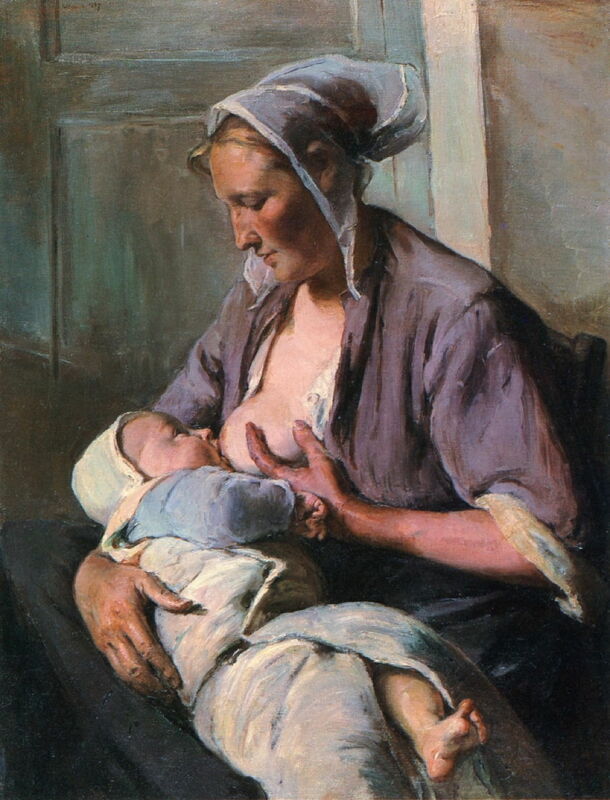 Elizabeth Nourse (1859–1938), Motherhood (1897), oil on canvas, 87.6 x 66.7 cm, Private collection. The Athenaeum. Motherhood (1897) is a superb study of the gaze of a mother and her baby, but the woman is not a conventional subject for such a portrait. Her face is tanned from outdoor work, and her hands have clearly toiled long and hard in the earth. Nourse’s social realism may be subtle, but it is very real – this is not something invented in a studio for effect. 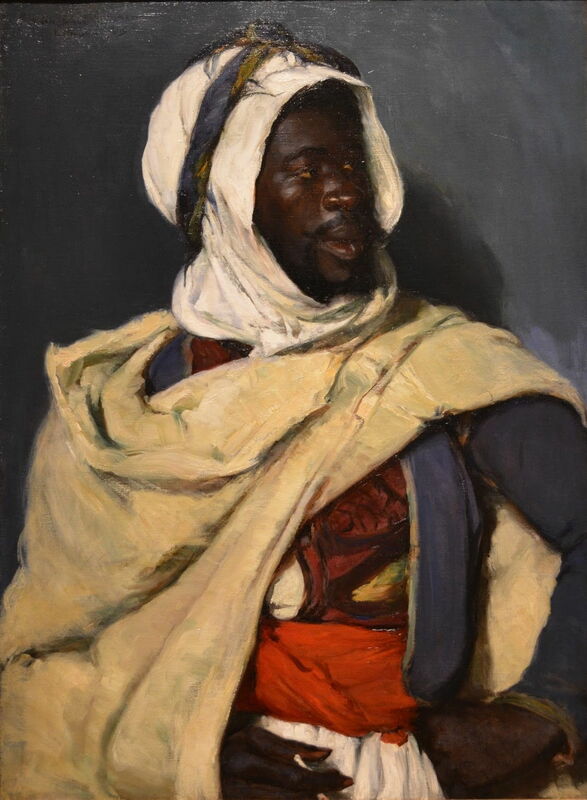 Elizabeth Nourse (1859–1938), Head of an Algerian (Moorish Prince) (c 1898), oil on canvas, dimensions not known. New Britain Museum of American Art, New Britain, CT. Wikimedia Commons. One of her best-known works, Head of an Algerian (Moorish Prince) from about 1898 suggests that she may have visited North Africa. Her brushwork is now wonderfully loose in her subject’s clothing. Elizabeth Nourse (1859–1938), Return from Church, Penmarc’h (1900), media and dimensions not known, Cincinnati Art Museum, Cincinnati, OH. Image by Sailko, via Wikimedia Commons. 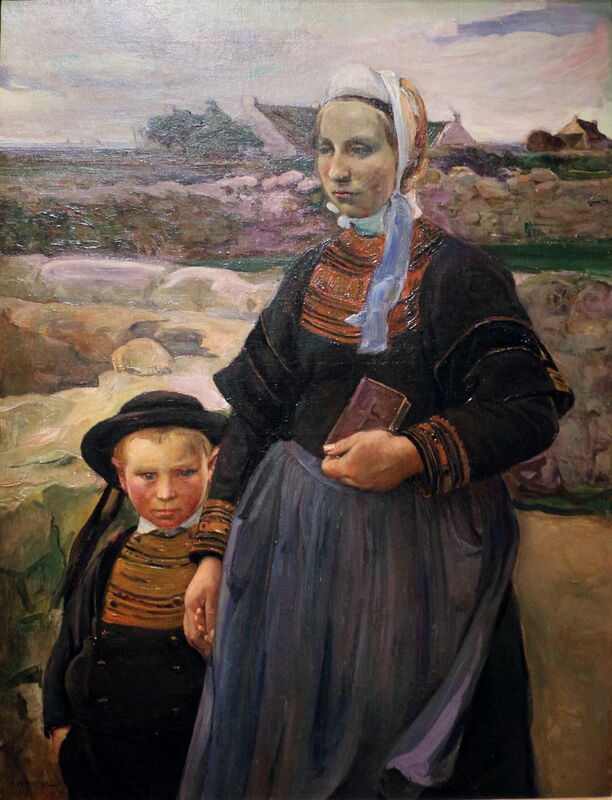 Around the turn of the century, Nourse appears to have been visiting Brittany, in particular the extreme west coast, where she painted this mother and her son as they made the Return from Church, Penmarc’h in 1900. Elizabeth Nourse (1859–1938), Brother and Sister, Penmarc’h (c 1901), oil on canvas, 61.6 x 48.2 cm, Smithsonian American Art Museum, Washington, DC. Wikimedia Commons. This double portrait of Brother and Sister, Penmarc’h (c 1901) is more sketchy, but looks to be in an almost identical location. In 1900, Nourse was awarded a medal for her paintings exhibited at the Exposition Universelle in Paris. Elizabeth Nourse (1859–1938), Belgian Flower Vendors, Gravensteen Castle (1902), gouache on paperboard, 33 x 41.9 cm, Private collection. The Athenaeum. 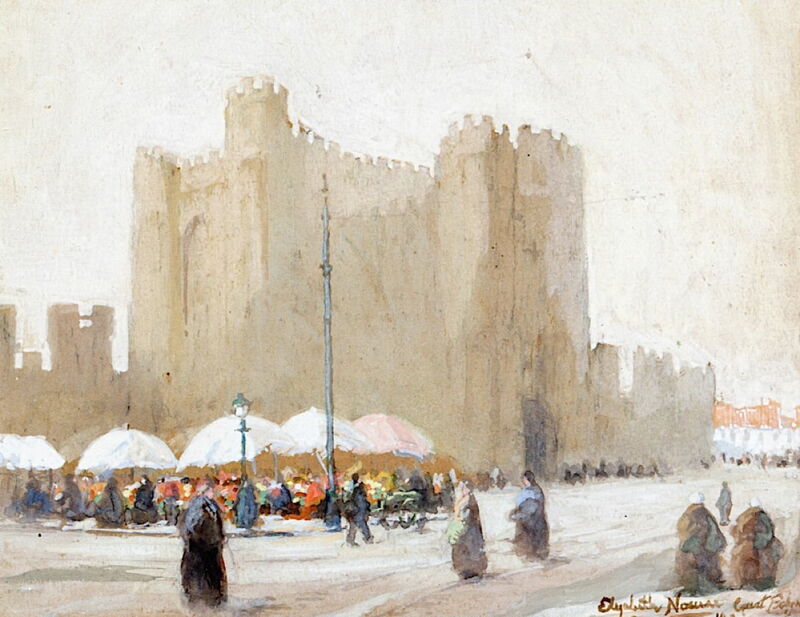 Most of Nourse’s surviving paintings were made in oils, but she also painted en plein air using watercolours and gouache, as in this sketch of Belgian Flower Vendors, Gravensteen Castle (1902). This castle is a famous landmark in the Belgian city of Ghent. Elizabeth Nourse (1859–1938), The High Meadow (1904), oil on panel, dimensions not known, Cincinnati Art Museum, Cincinnati, OH. Image by Wmpearl, via Wikimedia Commons. I cannot identify the upland area in which she painted The High Meadow in 1904. It appears to have been made in front of the motif in the foothills of the Pyrenees, in the south-west of France, or in central eastern France near the Alps. 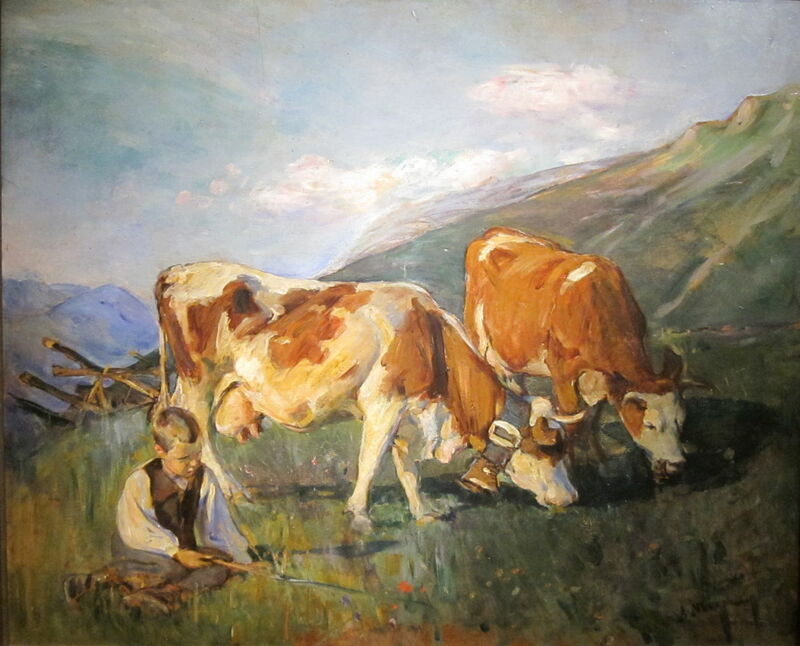 At that time, families split to take their livestock up into the higher pastures for the summer grazing, in what is known as the transhumance – an annual migration which dominated life in those areas. Happy Days (1905) is one of Nourse’s many tender and insightful scenes from family life. A mother is carrying out running repairs with needle and thread on the clothing of her child. The collection of objects on the mantlepiece behind suggests that they are not in abject poverty, but still far from well off. Elizabeth Nourse (1859–1938), Breton Interior (c 1907), oil on canvas, dimensions not known, Cincinnati Art Museum, Cincinnati, OH. Image by Wmpearl, via Wikimedia Commons. The signs in Nourse’s painting of a Breton Interior from about 1907 are more ambiguous. This little girl’s bed, and the well-stocked dresser beside it, appear quite comfortable. But she is draining the last of a bowl, and both mother and daughter are wearing wooden clogs. Elizabeth Nourse (1859–1938), Closed Shutters (1910), oil on canvas, 125 x 130 cm, Musée d’Orsay, Paris. The Athenaeum. 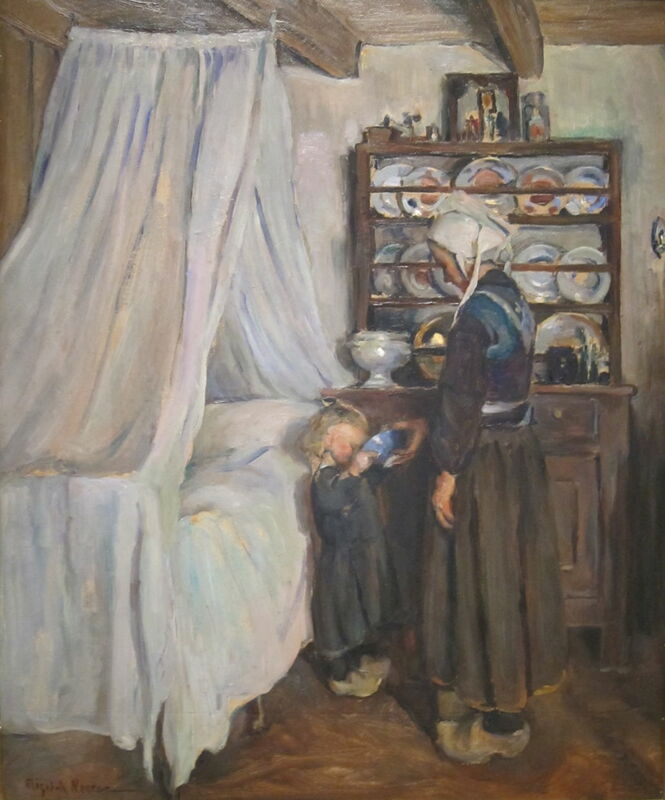 The last painting that I have to show for the life and work of Elizabeth Nourse is the most puzzling. 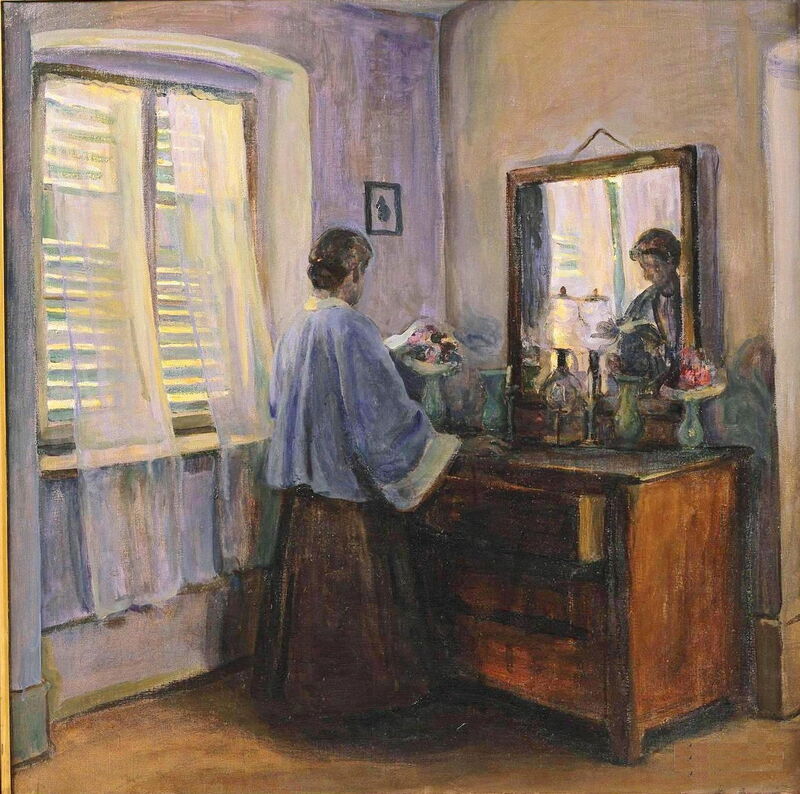 Closed Shutters, painted in quite modern style in 1910, shows a woman standing in front of a vase of flowers and the mirror hanging above a large chest of drawers. The shutters are closed over the window beside her, and the top drawer partly open, as is its reading. In 1915, Nourse was awarded a gold medal at the Panama-Pacific Exhibition in San Francisco. Nourse continued to paint until her sister died after the First World War. During that war, she distinguished herself by working for the relief of refugees in Paris, rather than fleeing Europe for the US. Her services to humanity were recognised in 1921 by the award of the Laetare Medal by Notre Dame University in Indiana. 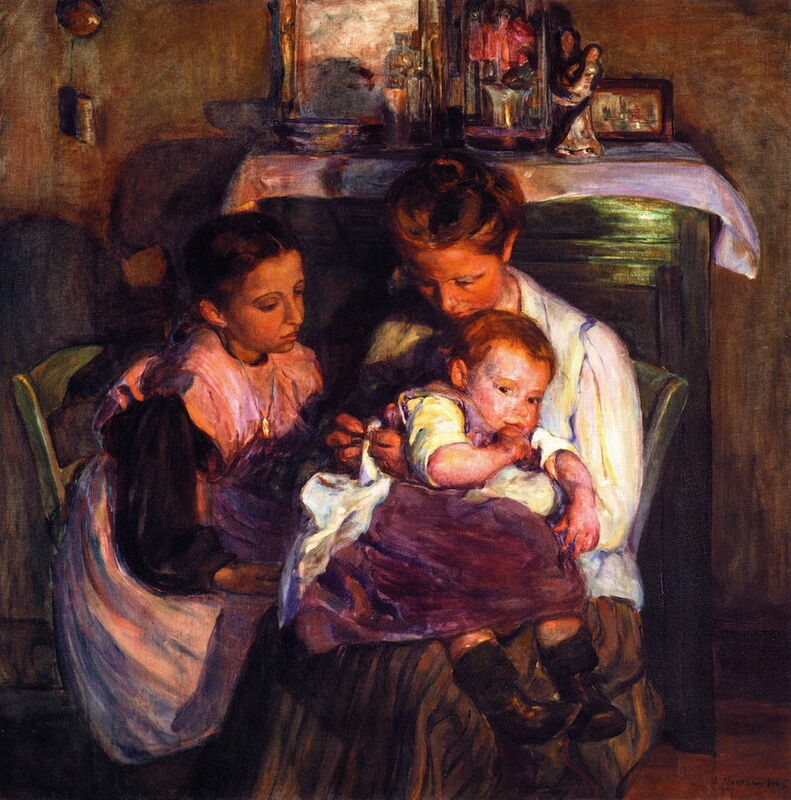 Elizabeth Nourse died in Paris in 1938, at the age of 78. She had been the first American woman to be elected to the Société Nationale des Beaux-Arts, and during her lifetime was recognised as the leading American woman painter. Many of her works are on display in the Cincinnati Art Museum, and there have been a few exhibitions of her work, but only in the US, as far as I can discover. Perhaps it’s time for one that brought her paintings the recognition which they surely deserve. Posted in General, Life, Painting and tagged naturalism, Nourse, painting, realism, women in art. Bookmark the permalink. Wow! Look how well she captured the light of the fire in Happy Days (1905).